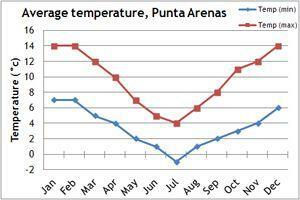 Our climate charts will give you a guide to the weather conditions of Chile. 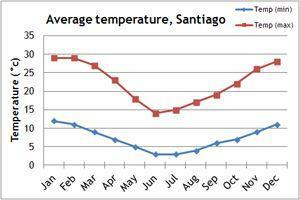 Chile's seasons are the reverse of the UK, with summer during the months of December to March. This is thought to be the optimum time to travel to Patagonia on a trekking holiday, but this is also when the wind tends to be strongest. Temperatures are in the mid teens to twenties. This is also the busiest time of year for tourists in Patagonia so do book ahead if you want to travel during these months as hotels and flights fill up quickly. Patagonia in spring and autumn can be just as good, although temperatures will be lower the wind also tends to be reduced. 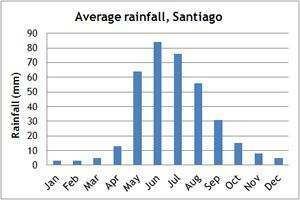 Santiago and the surrounding area is at its best in our spring and autumn months, whilst the Atacama desert is temperate and attractive at any time of the year - although nights can be very chilly at the higher altitudes you find there. The premium months to visit Easter Island are those in the spring and autumn - April and September. 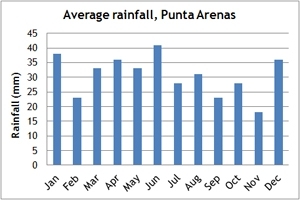 The months of June to September should be avoided in central and southern Chile as heavy snowfall can block access. If you can't make the dates of our group departures, then take a private departure on dates to suit you, or we can create a Tailor Made holiday to Chile, especially for you and your family or friends.